Hootie McWhat the hell is she doing? I am now registered to take the Basic Rider Training Course from Team Oregon. I have my mom to thank for this, much to her chagrin. See, many moons ago while I was working for attorneys, I had the opportunity to fly out to the middle of nowhere to search through boxes in a warehouse - I would have had to take a small plane. I do not like to fly. I really do not like small planes! My combined fears led me to decline the offer (it really wasn't that great an offer to begin with) - but when I told my mom about it, she sighed, and said, "You've lost your sense of adventure." I never forgot those words. Then many months ago, when a friend of mine asked if I wanted to go for a ride on his motorcycle, my first thought was "Oooh, isn't that dangerous?" My second thought was "I've lost my sense of adventure." So I went. And that's what started it - you're flying along, wind racing through your hair, the open road ahead, and that feeling of your stomach dropping out of the bottom of your boots when you go faster and faster ... it's like crack (or so I hear). And I'm hooked. Oh and did I mention the cool-factor? It's cool. So I'm going to learn how to ride a bike on my own. Then I'm going to buy my own bike. Then I'm going to be like a superhero - the straight-laced, mild-mannered administrative brokerage assistant by day (complete with french twist, pencil skirt and librarian glasses), biker by ... well... day and night... okay that may not work. I'll just have to work it like a double personality - Victor/Victoria style! Then I'm joining a gang. Just kidding. 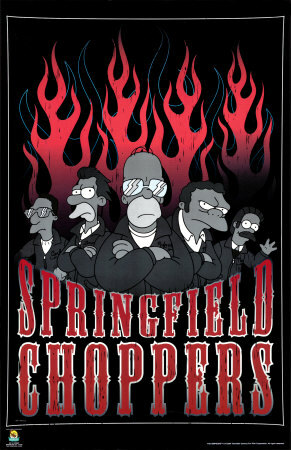 I'll start my own gang, like Homer did! I mean who wouldn't want a nickname like Meathook? And when Marge was a biker-wife, Homer dubbed her Chesty LaRue. And Hootie McBoob. I like that. They look just as excited as I am to see THE MOVIE. Oh for glaven out loud. Awwwww, THIS is BULL. Everybody knows that the Simpsons are from Springfield, OREGON. Seriously. Never been clear? Pshaw. People, I implore you. "I found Jesus. He was behind the sofa the whole time." Drunk bum: "You're really Duffman? Then I must be Jesus! Up, up and away!" Marge: "But Jesus wore sandals." Homer: "Yeah, and I'm just saying, if he'd had better footwear, maybe they wouldnt've have caught him." Out and about last night, some drunk weirdo from Chicago felt it necessary to give me his business card. You know what his business was? "Guitarist." Gimmie a break. You think Hendrix ever walked around passing out business cards? All I could think of was the card that Homer gave Marge when they were daing that read: "Homer Simpson, Quarterback." Tonight! 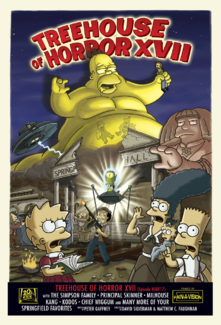 The 17th Annual Simpsons Treehouse of Horror. I'm so very excited. "What am I gonna die of? Too much happiness? Naked girl avalanche?" "Kill my boss? Do I dare live out the American dream?" "Bad corpse! Stop scaring Smithers!" "Burn her! ... gift certificate!" "No! Today's teenagers have enough problems without me eating them." "Must eat more fat people. Thank god I live in America." "It was either kill him, or kill no one!" "Yeah! Get him a woman! That'll end ALL his problems!" Boy: "I can tell when the pizza is done baking by the way it smells." Girl: "Oh yeah? Well Homer Simpson can hear pudding." Well. If it weren't for Murphy and his Law, then maybe the movers who were supposed to get us out of our old office yesterday around 3:30, would not have mis-scheduled us for moving today. Maybe the copier fellows would have tested our new copier earlier and not the day before it was scheduled to be moved into our new office, only to find out that it's dead as a doornail. Maybe our computer consultant wouldn't have been stuck in Vancouver working on a server problem. 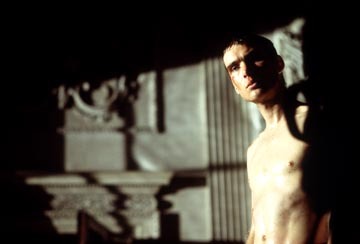 But thanks to Murphy, all of those things did happen, and therefore this Friday I'm sitting on my couch, talking to you good people, drinking coffee and watching one of my favorite zombie movies ever, 28 Days Later. Sweeeeeeet. Homer! Did you bar the door? Why? Oh! The Zombies. No.